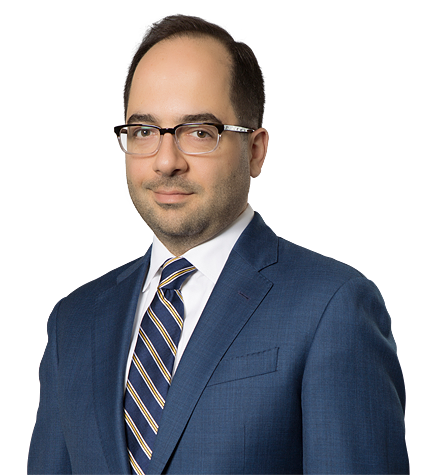 Kamran Vakili’s practice broadly encompasses a variety of areas within intellectual property law, especially patent litigation, asset creation and strategic counseling. He has worked closely with U.S.-based and international clients—ranging from Fortune 500 corporations to individual inventors and emerging growth companies—to develop, manage and protect global patent portfolios. Kamran’s experience spans the full patent lifecycle, from procurement to enforcement, including extensive experience prosecuting patent applications before the U.S. Patent and Trademark Office (USPTO), as well as representing both plaintiffs and defendants in litigation before state and federal courts at the trial and appellate levels, the U.S. International Trade Commission (ITC) and the Patent Trial and Appeal Board (PTAB). Kamran has also assisted clients with reissue and reexamination proceedings, patent landscaping, transactions and licensing, due diligence and patent opinions. He has worked with clients across a broad range of industries and technology areas, including electronic devices and circuits, computer software and hardware, wind and hydroelectric energy, digital communications, mobile devices, e-commerce, internet searching and advertising, social networking, game systems, consumer products and financial instruments. Kamran also maintains an active pro bono practice, with recent matters relating to immigration law, municipal zoning and patent prosecution. Prior to joining the firm, Kamran worked as a technical advisor, patent agent and associate lawyer for a major New York law firm. Before starting his legal career in 2006, he worked as a scientific researcher in the field of low-dimensional semiconductor physics. For his doctoral research at Princeton, Kamran explored self-organizing behaviors of electrons in two dimensions. The results of his research have been widely published in academic journals and have been included in a textbook on the subject of interacting electron physics. Represented inventor and leading manufacturer of popular self-balancing personal transporter in ongoing patent infringement matters, including obtaining highly favorable claim construction ruling in proceedings before the ITC and successfully defeating institution of inter partes review challenge before the PTAB. Represented dermatology startup in inter partes review challenge of competitor patents, including successfully invalidating all challenged claims on multiple grounds and securing competitor’s stipulation against appeal. Represented semiconductor processing equipment manufacturer accused of patent infringement in inter partes review challenge of the asserted patents, leading to client-favorable settlement. Represented leading provider of industrial automation products asserting patent infringement related to factory controller technologies, resulting in eight-figure damages award following a jury trial in federal district court. Represented mobile advertising startup before the USPTO, including drafting and prosecuting a portfolio of patent applications yielding six issued U.S. patents, bolstering seven-figure IP-centric acquisition. Performed comprehensive patent due diligence for client private equity firm in connection with eight-figure investment in driver risk management company. Provided pro bono representation to husband and wife legal permanent residents facing deportation, including briefing an appeal of the removal order before the U.S. Court of Appeals for the Ninth Circuit, engaging in mediation proceedings, and ultimately obtaining remand for certification of the client’s previously unknown entitlement to U.S. citizenship. Part of a pro bono consortium of law firms successfully obtaining grant of a peremptory writ of mandate against a local municipality to rewrite a zoning ordinance easing restrictions on homeless shelter development.